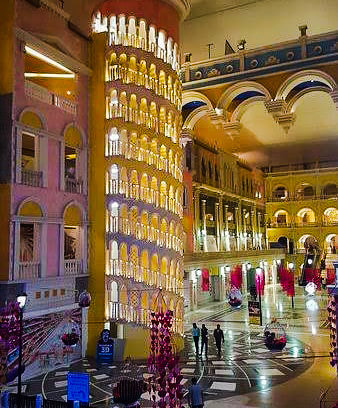 My Unbelievable Experience Of The Grand Venice Shopping Mall: I explore this shopping mall in recent times and I suggest you all to add this in your list if you are near Delhi. The Grand Venice shopping mall at Greater Noida in the state of Uttar Pradesh, India and is also connected with Delhi NCR is the most amazing shopping mall I have visited. This shopping mall is my favorite shopping mall in India mainly because of its architecture. If you are passionate traveler like me then this shopping mall will definitely attracts you because the architecture of this shopping mall designed in the theme Venice in Italy. So visiting this mall can be an offbeat locations for travelers near Delhi to experience the vibes of Venice at here. 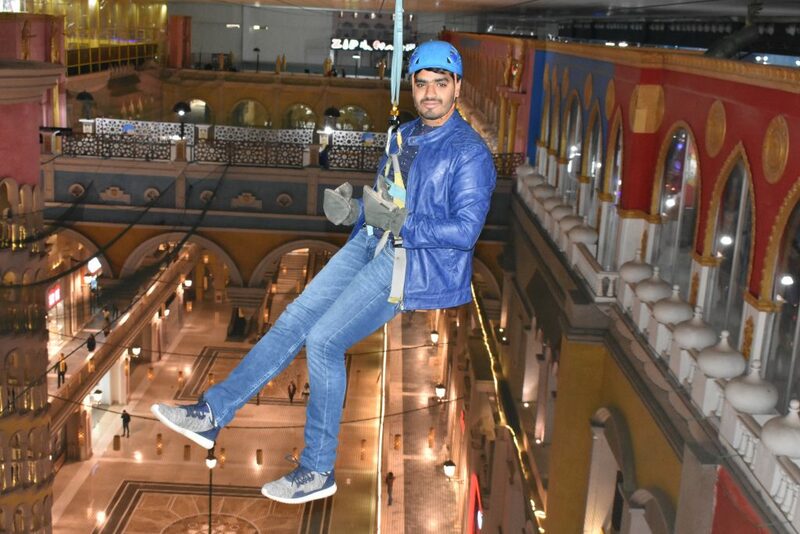 The Grand Venice shopping mall not only attracts you for its amazing architecture but for its adventure activities like zip lining and Gandola boat ride. Yes you heard right at here you can experience Zip lining and boat riding which takes this mall to another level. So let’s not waste any time and it’s time to make you feel the vibes of Venice while visiting The Grand Venice shopping mall through my experience. Let me take you to flash back, I am from Jammu city went to Noida 2 years back where I heard about this amazing shopping mall and since then I am planning to visit this mall. As it says the “Journey is itself a destination” same thing happen with me luckily I got my accommodation near to this shopping mall at Greater Noida but that time it was opened full yet construction was still on but it looks beautiful that time too. By the time I switch my job which was at Gurugram in the state of Haryana and is also connected with Delhi NCR so since time taken from Noida to Grugram is 2 hrs which force me to shift my accommodation in Gurugram. Since then I never got a chance to visit this shopping mall but I planned a lot but every-time my plan got cancelled. So on July 27 2018 I left my job and decided to go back to my home town Jammu city but before that I want to experience The Grand Venice shopping mall once so I book my train tickets for Jammu on 30th July and plan to visit the mall 29th July. My roommates in Gurugram are also from my hometown Jammu city so I insist to them to visit this mall along with me but they have to go to their job so I went to Grand Venice shopping mall alone from Gurugram. I catch metro from Sikandarpur metro station in Gurugram on yellow line metro route to Rajiv Chowk and from their I catch blue line metro towards Noida and took exit at Botanical garden metro station. From Botanical garden metro station I took bus to Greater noida and deboard at Pari Cheek from Pari chowk the mall is 1.5 Kms away which I reached by auto rickshaw. Finally after 2.5 hrs of travel from Gurugram, I reached at The Grand Venice shopping mall. As I told you earlier last time construction was still on so this time I was expecting a lot of innovations. As I expected this shopping mall amaze me to know that they have started Zip lining and Gondola boat ride. To me visiting this mall is amazing because Venice is my one of the favorite places in the world so that’s why I planned to visit this mall before going back to Jammu city. Quickly I explore the whole area around the staircase which was actually designed in the shape of Leaning Tower of Pisa. I suggest you to avoid escalator rather than to go to top floor through stairs. One thing is sure one way or the other this mall attracts everyone. As I reached to the top floor through stairs the next thing I saw is Zip lining which I did the view of this mall from the zip lining arena looks beautiful. I paid RS 500 for zip lining and photo develop along with soft copy from their photographer which cost Rs 300. After exploring the mall from the top via Zip lining and now it’s time to explore the mall from ground floor via Gondola boat ride which I enjoyed a lot. I paid RS 300 for this ride and explore the whole area of the mall via boating. So by the time I hardly know it was 5 pm and I had to go back to Gurugram to pack my luggage to catch the train to Jammu city next day. I reached 8 pm back to my accommodation in Gurugram. The time I went their was unbelievable and I strongly recommending you to visit this mall once if you are near Delhi. In the end, I hope you like my experience of the grand Venice mall. wow that mall looks amazing! so well done! its a bit far for me, but you never know where my travels will take me next! found you on fb travel bloggers club and pinning!